Metal Roofing is durable but older profiles with screwed down seams are prone to leaks. Common repairs with mastics and tapes usually aggravate the leak. Metal Rust - Corrosion occurs when the protective coating or galvanization of the roof wears out and bare metal is exposed. 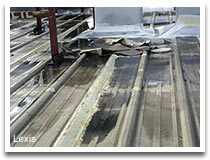 Flashings - A majority of metal roof leaks are caused by poor flashing design along penetrations. Temporary Repairs - Stop using seam tapes, mastics and silicone sealants on a metal roof. They aggravate the leak! 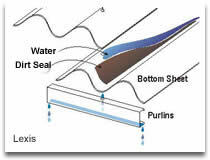 Seam Leaks - If you have an older metal building constructed using panels with exposed fasteners and seams. Annual maintenance includes patching any holes and treating any rusted areas as soon as possible. Avoid using asphalt mastics, silicone sealants and aluminum and plastic backed tapes on the seams. Learn more about Metal Roof Repair or Metal Roof Coating. Add 10 or more years to your metal roof with our metal roof restoration system. Get a seamless roof without costly tear off and disruption. Stop roof leaks. EnergyGuard® Acrylic Elastomeric Coating is the most popular choice for metal roofs. EnergyGuard® Butyl Elastomeric Coating offers better elongation and protection against rust. 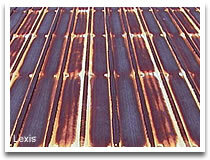 The solar reflectivity of metal roofs depends on the color of the finish. Dark colored metal roofs can reach 180°F or more in the summer. The heat load of a black roof can severely degrade the performance of airconditioning equipment. Elastomeric coatings provide the highest reflectivity and is a very popular option for building owners. White roof coatings can reflect up to 90% of the heat from the sun.